It all started with a fundraising campaign. Casita Copán founder Emily Monroe was working as a teacher in Copán Ruinas, Honduras and spent her free time volunteering with some coworkers at the nearby orphanage. She was struck by the desperate living conditions but also inspired by the tough spirits and spunky personalities of the children living there. Emily started raising money to improve the conditions of the orphanage and was shocked to discover the flood of interest from people around the world who cared about the well-being of these amazing children. As time passed, Emily learned more about the challenges facing the local orphanage and realized that the money raised would be better spent on creating a new organization dedicated to providing a better quality of care to orphaned and vulnerable children in Copán Ruinas. In May, she assembled a group of concerned citizens to form the Honduran Board of Directors. This group of enthusiastic professionals, teachers, artists, and business owners filed the paperwork to form an official nongovernmental organization. Casita Copán was born. The new Board of Directors spent time listening to the community to figure out how to provide the best and most appropriate services. We realized that Copán Ruinas didn’t need just another orphanage, it needed services for single mothers and vulnerable children that could actually help prevent child abandonment from happening in the first place. We learned that many single mothers were forced to leave their children at home alone or at the local orphanage while they worked. Children were left without attention, care, and often without food for most of the day. We decided that the best way to address this need was to open a daycare center. On September 10, 2012, “Children’s Day” here in Honduras, we opened a brand-new daycare center for children of single, working moms. We started out with just two staff members, two volunteers, a few toys, barely any furniture, but tons of energy and hope. Within just a couple of weeks, we welcomed 15 children into our care, including 9 kids who used to spend all day in the bleak conditions at the local orphanage. Our goal was to create more than just a daycare center, but a true extended family where the children would feel at home. We were also dedicated to providing healthy meals, medical care, tutoring, educational support, and much more. In October, we registered as a charitable organization in the United States. By February, we had already grown out of our first home and it was time to expand. We moved into a bigger location and welcomed two new families of children. By this point, we had hired five local women full-time to create our staff. In just a few months, we saw huge changes in the children, including their general health, emotional well-being, and intellectual and social development. Children that had started out malnourished and reserved were now bright, energetic, healthy kids. We realized early on that children learn most in the home. If we really wanted to help children, we needed to help their mothers too. One of the things we noticed was that nearly all of the mothers that we served never had the chance to go to school and couldn’t read or write. This kept them trapped in low-paying jobs and made them easy targets for exploitation. In June, we started a literacy program specifically for moms. We partnered with the Ministry of Education so that our moms could receive an actual primary school diploma upon completion of their studies. Once again, we grew out of our home and it was time to move. By this point, we were serving 35 children in our children’s center and providing literacy classes and a life-skills program to 14 single mothers. Our new center was big enough to really spread out. We finally had office space and a huge outdoor area for the kids to play. We now had a staff of seven local women, including a part-time psychologist who provided individual counseling to moms and children and also vital staff development. On July 1, 2014, one of Casita Copán’s original dreams came true. At long last, the local orphanage was closed down by the government, and the 13 children who had been living there were transferred into our care. We now had a chance to provide quality, loving care to the amazing children who started this whole thing. We are committed to giving these children a safe, healthy, and loving childhood and helping them grow into capable and independent adults. In April 2015, we launched the program model that we had always envisioned and that inspired the name Casita Copan. 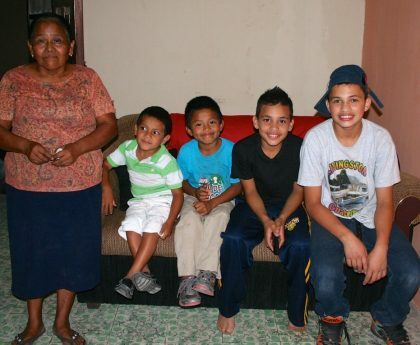 We opened three "casitas" or permanent, family-style homes for the 13 orphaned children in our care. Each Casita is home to 4 or 5 children and a foster mother who has committed to raising the children in her care as her own. The kids were so excited to move into their new Casitas where they finally had a real space of their own to call home. Casita Copan is a vibrant organization that provides life-changing programs to children and women in our community thanks to the incredible support of our staff, volunteers, and donors. We are excited to see how the story continues!